My absolute favorite thing to buy at Trader Joe’s is their Pumpkin Butter. Since I’ve moved, the closest store is an hour away and running out and buying a jar is no longer feasible. 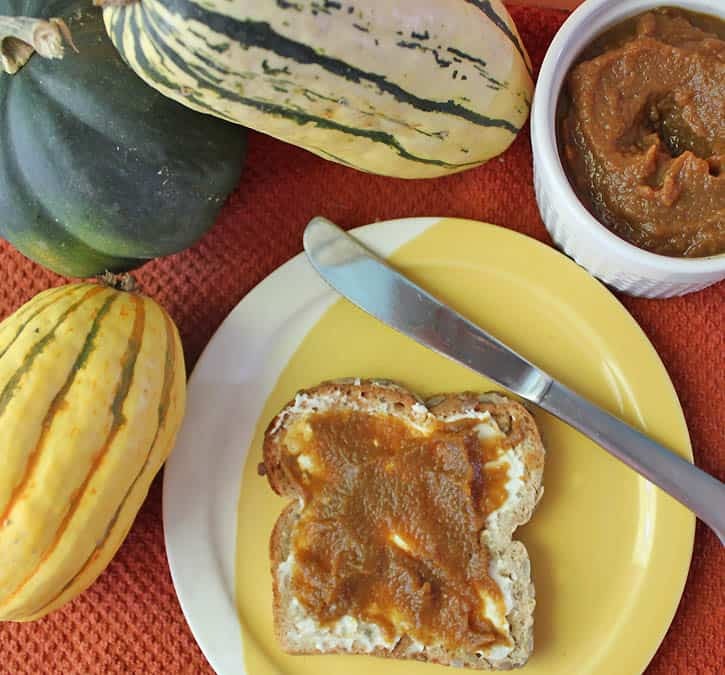 After doing some experimenting in the kitchen I came up with a Pumpkin Butter recipe that tastes just as good as the Trader Joe’s version! Combine pureed pumpkin, vanilla, apple juice, sugar and spices in a saucepan. Stir well and the bring the mixture to a boil. Lower heat, and simmer for 30 minutes or until thickened, Stirring frequently. Enjoy on toast (I like it over cream cheese), in oatmeal or as a dip for apples. How long does it keep? I'm assuming you store it in the fridge, is that right? Yes, store it in the fridge. Since it has no preservatives I wouldn't keep it longer than 2 weeks.